Take the recent case of a custom hinge for a medical application. In 2009, a new customer requested a quotation for a replacement hinge on their enclosure. The customer was looking for a load-bearing counterbalance hinge of the type used to control the vertical opening and closing of heavy lids (like those on chest freezers). The hinge currently in use was sent to Southco for evaluation so that they could propose a custom design and provide costing data. For a number of reasons—including the possibility of making the hinge inexpensive enough to justify turning it into a new catalog product —the NPD team gave the go-ahead for manufacturing at the Honeoye Falls facility to run a DFMA pilot analysis on the hinge. Now the hunt was on for ways to lower costs, assembly costs in particular. A tactic of choice was Design for Manufacture and Assembly (DFMA)®, a rigorous design analysis methodology from Boothroyd Dewhurst, Inc. (Wakefield, RI). By using DFMA, the product development team was able to dramatically reduce assembly times and costs and eliminate several manufacturing operations so that Southco could make the hinge profitably while still meeting the customer’s requirements and stringent price targets. In the case of the counterbalance hinge, the manual assembly work was the bulk of the product cost. For this reason, the team focused on applying Design for Assembly (DFA). DFA quantitatively evaluates both part designs and the overall assembly, helping engineers to identify unnecessary parts as they determine assembly times and costs. It also offers strategies for eliminating parts. The outcome of a DFA analysis is a simpler, more elegant product that is both functionally efficient and easy to assemble. 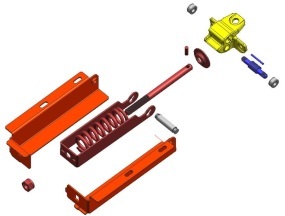 For its analysis, the team at Southco relied on the Design for Assembly methodology and database, which documents part handling and insertion times and also assigns codes that indicate handling and insertion methods. One of the lessons learned from the DFA analysis was how fasteners like nuts and bolts add significant assembly time—for example, orienting the nut on the bolt, picking up the driver, driving the nut, and putting down the driver. Center Housing. This subassembly sits at one end of the counterbalance spring. The column identifying the minimum number of parts suggested that there were excellent opportunities for reducing assembly times, particularly for screw driving and bracket assembly (See Table 1). This analysis decreased component cost by 60 percent. It also eliminated the need for three stamping dies, one tapping operation, one screw-driving operation, and the tooling cost to build the fixtures. Many of the remaining parts made up the center shaft that attached the counterbalance to the stamped housing. 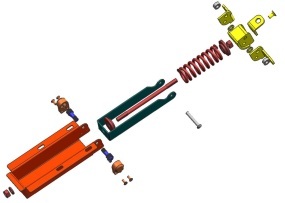 By redesigning the shaft, the team did away with four fastening screws, cut out several other parts, and simplified the two die-cast housings at either end of the shaft. The final redesign trimmed part count from 29 to 23 and component costs by 28 percent, even though the new design added a stamping operation for the split housing. The redesign also did away with four tapping and four screw-driving operations and one die-cast mold. The team replaced the custom-turned shaft with a standard one that had threads on one end. At the top end they eliminated the nut (and its long assembly time) by adopting a floating-pin strategy similar to those used on many automotive valve train assemblies. They also removed a rivet by creating a tapered holding pin and substituting slots for the round holes of the spring guide. “Sometimes the opportunity to improve a design outweighs the drive toward part reduction,” Langkamp notes. For instance, the team discovered during cycle testing of the prototype counterbalance that premature wear on the shaft caused squeaking. Adding a plastic bushing solved that problem. In addition, the customer requested an increase in the force specifications on the counterbalance, which required an additional spring (mounted inside the original spring) to support higher loads, as well as a cup washer to provide centering. Even with the additional parts, the final design reduced component costs 28 percent and eliminated one rivet peening (flattening) and one nut driving operation. The redesigned counterbalance hinge (see Figure 2) is now in full production (10,000-15,000 a year) at the Southco Honeoye Falls Facility. It fulfills all the requirements proposed by the customer, is quieter in operation, and bears higher loads as well. The new hinge more than met its costing goals. Total component count went from 45 to 30 pieces. Total assembly operations dropped from 14 to 5. The overall cost of the hinge was reduced by 53 percent, profits increased to a level that made it possible to market the hinge at an attractive price. This view shows the center housing (top right, yellow), hinge point (bottom left, orange), and counterbalance (center, red and green) subassemblies.